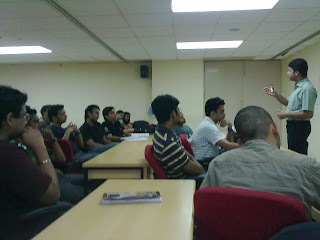 On 2nd March 2011, $ystem@tics Club, organized a session on “Profiles offered by Industry”. The guest speaker, Mr. Neeraj Ghate is an alumnus of the 2007 batch of SJMSOM and is now working in Deloitte, Mumbai. He discussed various profiles being offered in different domains and answered numerous doubts of the participants. 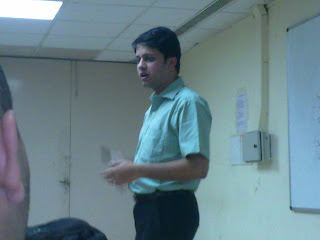 Neeraj discussed about a wide array of profiles with the students. Although he works as a consultant in Deloitte since May 2007 he did not restrict the discussion to only IT profiles like Business Consulting, Functional Consulting, Project Management, Sales and Pre-sales, but he also discussed the numerous profiles in other domains like finance, operations and marketing. Talking about the profiles in Finance, Neeraj covered Equity Research, Corporate Finance, Portfolio Management, Investment Banking, and Private Equity Consultant etc. among many such profiles. While talking about Marketing Stream, he clarified the difference between Marketing & Sales and elaborated about the various functions in different marketing profiles. He also discussed the different career opportunities in operations like SCM consultant, purchase manager etc. He also stressed on the fact that the choice of career should be made based on personal interest like people who are working in IT/Consulting would get to have a lot of interaction with Global Clients while those who work in Operations would get to drive the whole plant operations with hundreds of employees working under them. He also covered profiles which are an amalgamation of different domains like banking operations, IT pre-sales, leadership roles etc. The two hours session also entailed a discussion on life after placements. After having gone through the entire MBA program, placements and being in corporate life, he shared his story and gave an expert advice on how to make the best use of the time during MBA and relationship building (networking) which can be capitalized on for attaining long term benefits. The Participants appreciated the efforts of Neeraj in taking deep interest in helping them to understand the nitty-gritty of various Profiles and the Placements process. Vijay, on behalf of $ystem@tics Club as well as the SOM12 Batch delivered the vote of thanks when the session was concluded. How will passing out from SOM change lives? Will it change your vision and mission in life? How about in dealing with relationship banking?